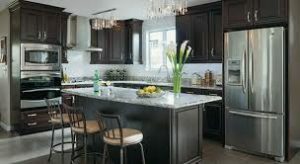 Last Updated: April 12th 2019 Kemper is a subsidiary of Masterbrand cabinets Inc who are one of the leading cabinet makers in the world. They pride themselves on creating excellent home furniture and have strict quality checks to ensure the products are up to scratch. Kemper upholds these standards by producing high quality units. In this Kemper Cabinet Reviews guide we will focus on the history of Kemper Cabinetry, their types of cabinets, their cabinet quality and styles, and Kemper's cabinets warranty policy. Kemper itself was founded back in 1926 in Richmond, Indiana. They began as a small operation, producing only wardrobes, and have now grown into a diverse furniture company that make a range of different products. These are the 4 pillars of Kemper cabinets and the evidence is there from design to manufacture that every effort has been made to create useful and attractive cabinets. Kemper have become a very popular brand by staying at the forefront of the trends and changes in the industry. They take their 90 years of experience and put it into each piece, while incorporating modern features and fashion trends. Kemper is only sold in approved dealerships, to ensure good service to the customer, and is present in homes across America. If you need another American company focused on craftsmanship then I suggest you take a look at our review of Thomasville cabinets as well. Kemper make storage solutions for the whole home and have several collections for bedrooms, dining rooms, bathrooms and offices. They produce speciality units like their vanity hamper, CD and DVD holder and their spice rack which are uniquely useful to your home. Kemper have always specialised in kitchen cabinets and offer a whole host of options to make the cabinets of most use to you. 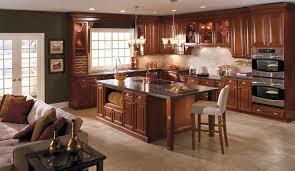 Kitchen cabinets need to look good, and if you choose the right one it brings together the whole kitchen. The most popular choices are between base units and wall mounted units, depending on the shape and layout of your kitchen. Each of these materials will give a completely different look and feel to your cabinet so you’ll need to look at all of them to make sure you match existing furnishings. 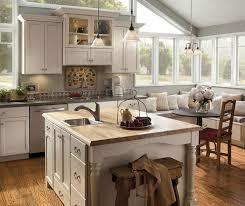 Some are more suited to modern kitchens and some to traditional, talk through the different options with your dealer. If you are looking for another brand that offers a wide range of materials and styles I suggest Kraftmaid! Within each of these choices you have a range of styles. These vary greatly and this gives you full design choice when it comes to your cabinet. Take some time to look through all of the options so you make the right decision for your home. Choose from 144 different finishes on the wood to customise the colouring. Split into light, medium and dark there really is a massive variety of colours to choose from. The range of finishes for this price range is impressive and you’ll be able to match your cabinets to your kitchen in an effective way. Finally you can choose from a range of different embellishments and features to further personalise your cabinet. Speciality knobs and handles, glass doors or metal frames are all available so even if your kitchen is pretty unique you can make a cabinet to match. Kemper produce kitchen furniture that doesn’t just look good but fulfills its purpose. You can choose from a variety of shelves, drawers or display cabinets to make your cabinet as useful as possible to your life. All of these construction choices impact the quality of the cabinet. Kemper cabinets have some of the latest materials and mechanisms around which are built to stand up to wear and tear. The thick sides and back give a sturdy unit which you can rely upon. Kemper units are well made and are up to industry standards. They aren’t using as much hardwood in their products but you normally have the option to upgrade. Nevertheless the construction quality is ok and for this price range fairly reliable. “Excellent product Very happy with the quality and service!” - Theodisa D.
“Our cabinets are very shoddy and flimsy. They cost $25,000 for the kitchen and we've had to send several cabinets back because of split wood, peeling paint, warped doors, out of square (almost all) cabinets, etc. I could not be more disappointed in the brand” - Marco P.
Reviews like this are worrying because Kemper pride themselves on the quality they produce, however every company does make mistakes now and again. Kemper are a mid range brand and while that doesn’t excuse defects, it means the quality isn’t going to be comparable to a lot of higher end cabinet makers. That being said there are a lot of positive reviews and people seem pleased with the value provided by Kemper. Kemper stand behind their products and offer a lifetime guarantee to cover all workmanship and material defects under normal use. This doesn’t cover the products if there it isn’t used for the designed purpose or if it’s modified in any way. Always talk to your dealer before purchase about exactly what is covered by the warranty, and where to talk any complaints if issues arise. That way you’ll always know where you stand if something does go wrong. Kemper are a mid/low range cabinet producer and that means the quality can be a little poor. You can’t expect the cabinets to last as long as some of their competitors because the materials and craftsmanship isn’t there. However that doesn’t mean Kemper aren’t providing good value to your home. Kemper have affordable furniture with a massive range of options to customise the units to your tastes. They’re offering a budget alternative to the high end brands and on the whole delivering what you expect. In the furniture industry you do get what you pay for to a certain extent, but if you’re careful with the cheaper brands you can walk away with some good furniture at a great price. Always upgrade what you can and be sure to understand your warranty if something does go wrong. Kember cabinets are stylish and useful, with a pretty good price tag. 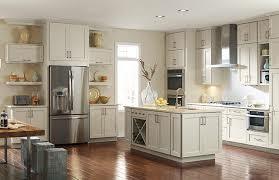 If you’re in the market for mid range cabinets then they might be the choice for you. 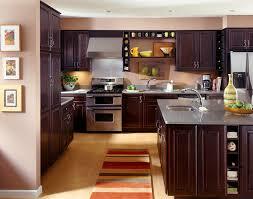 You can check out our collection of kitchen cabinet reviews at our kitchen products page!